Our eyes are our chief means of navigating God’s world. Most of the needful information regarding earthly life is provided through these very delicate organs. Having rather poor eyesight myself, I know well the way that the world recedes into obscurity and confusion when I can’t find my glasses, or run out of contact lenses. But can something like “the salvation of the Lord” be seen? 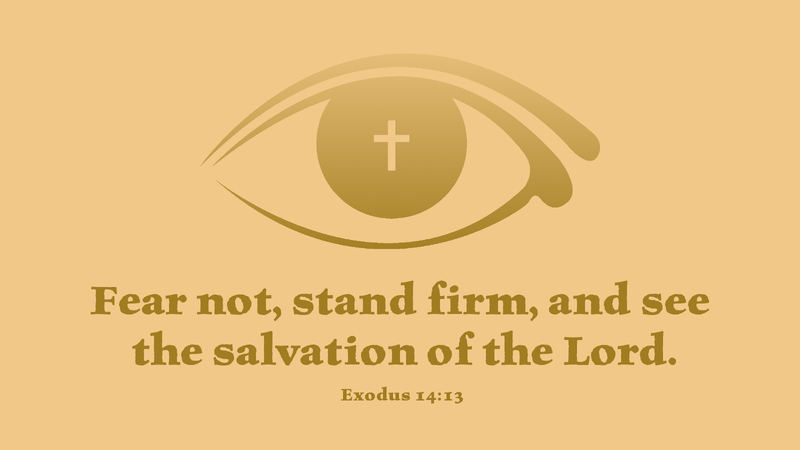 Here in Exodus, “salvation” refers to the wonderful act that God was performing in the midst of the Israelites, as the waters parted and they were protected by the pillar. In these, God was definitively present—saving them from their Egyptian oppressors. In the Gospel for today, Jesus tells his disciples that, seeing Him, they have seen His Father in heaven. They have seen God, the very source of salvation! This is not simple bodily vision. It is human eyesight coupled with faith. Faith is the organ capable of seeing Jesus for who He truly is, the perfect revelation of the Father. With these supernatural glasses, we see Him as the Saving God, mercifully present for us in all His power. This power is ever present as we grasp the Word and Sacraments by faith. Prayer: Holy Father, give us faith to see the powerful salvation that you have provided for us in the person of your Son, Jesus Christ our Lord. Amen. Today’s devotion was written by Christopher Porter, pastor of Advent Lutheran Church, Winchester, VA.